The idea of one foster baby was do-able. One baby easily could have a small basket full of diaper changing supplies and be done on the couch. A one year old added to it....required a designated changing table area. BUT....there wasn't really any room for a changing table. Heck...we were having a hard time making room for two cribs! Then I had a brilliant idea....if I do say so myself! It doesn't happen very often, so I was excited. And I hadn't searched Pinterest...so it really was my own idea!! I drug Dave to our linen closet that was over-full and in need of some serious cleaning. I shared my vision of a diaper changing station behind these closed doors. I quickly cleaned out everything and took three large contractor trash bags to Goodwill and Dave started removing a few shelves! It was starting to look like a diaper changing station. The nicest thing about it...when we don't have foster babies....the changing table isn't taking up any room! 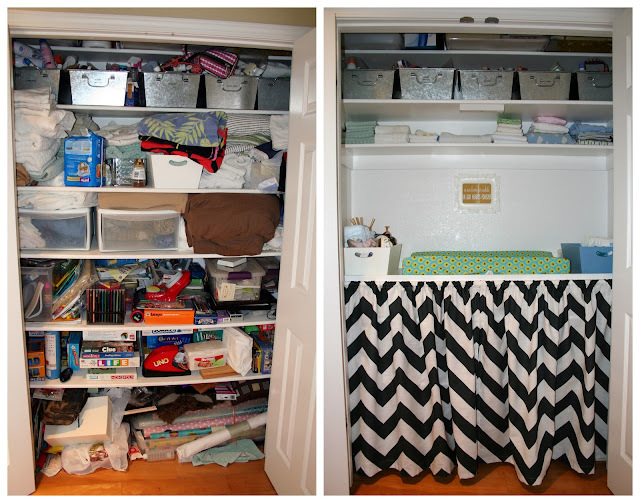 I made the chevron curtains to hide all the linen closet supplies to try to help keep it looking tidy. That sweet changing pad cover is from Dandelion Puff! It fits the curved changing pads perfectly! The print above was a custom print made for me by Be True Image Design...but I need to print it bigger! It says....In our home for awhile...in our hearts forever! I have to say the almost finished product is one of my proudest! I still want to make a little flag bunting to hang in there and repaint the blue bin to turquoise...of course! I show anyone who walks through our doors. Plus...for Small Living Spaces, it is perfect! Little Mister's diapers are to the right in the blue bin and Little Miss's diapers and shoes are in the white bin to the left. So easy to keep it organized and clean. Here is Small Spaces :: Making Room for Baby Part One. That rocks! You guys did a great job. Those curtains are awesome! This was such a great idea & it looks wonderful! I'm so impressed. I tend to wonder how the heck we're ever going to fit a baby in our place (we're not trying yet, but maybe in a year or so) but seeing you do these posts it seems do-able. WOW! What an awesome transformation! You rocked it! INCREDIBLE! This looks awesome!!! Way to go! What a fantastic transformation. Fantastic! That is truly fabulous, April!!! I wish we had linen or hallways closets to do such a thing with!!! I wish I had storage, period! lol. I feel like I have the storage of a 400sq ft NYC apt. I never comment on blogs, but I read yours all the time. THANK YOU for sharing your home and this series. We have 4 kids, but we hope to foster one day, and you have given my such hope and inspiration to do so! Andy and Jennifer....thank you so much for your comment! Actually...thank you everyone for your kind words. It was a really fun little project and I look forward to finishing it off with a few more little pieces of decor! haha...Kristen! you made me laugh out loud. Really I wish we could be on a reality TV show and you would see EVERYTHING I DON't do!! BUT thank you so much for your sweet words. I love this transformation of making do with the space you have. And I LOVE the chevron curtains! I love how it's now so functional. Good work D & A Home! Thanks Kami! D & A home is in full swing. Ok, THAT is super cool! What a great idea! !